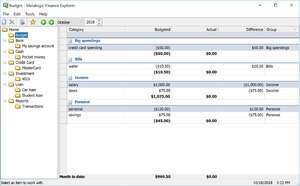 Finance Explorer is a small and simple accounting program which helps you take care of personal accounting, taking into account your expenses, purchases, stocks and net worth. Within Finance Explorer, you are able to manage credit cards, banking data, financial goals, stocks and more. It conveniently categorizes this data for ease-of-use allowing you to have a better overall idea of your financial situation. Also interesting to note with Finance Explorer is its ability to import (and export) data from other programs like MS Money. Version 9.0.0 is a freeware program which does not have restrictions and it's free so it doesn't cost anything. For security reasons, you should also check out the Finance Explorer download at LO4D.com which includes virus and malware tests. Additional screenshots of this application download may be available, too.